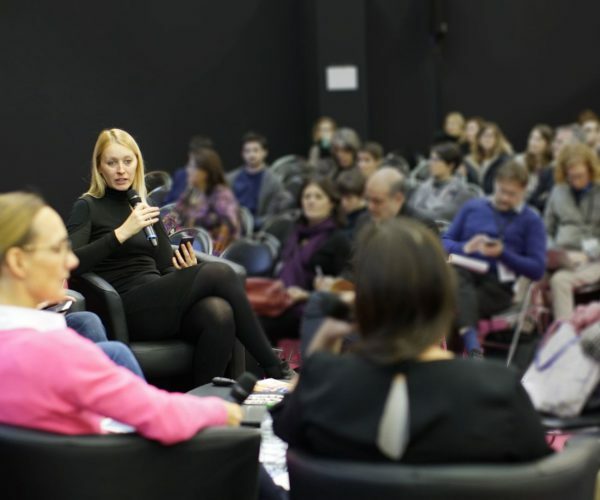 In addition to the 8000 m² exhibition area, ​​Museum Connections is also an international conference and workshops cycle, organized by Diane Drubay and in collaboration with the organization team. Inspiring and professional, the Museum Connections conferences are two days of intellectual excitement for cultural professionals who wish to see their institution evolve with the world around them. Bringing together the international experts who shape the future of museums, we accompany you to deploy your entrepreneurial potential discussing innovations and audience strategies but also the management of your brand or your shop and many other topics relevant today. For its 5th edition, the Museum Connections conferences will be a mix of inspirational sessions, debates and discussions around the key topics that are changing today the business of tomorrow’s museums: open digital collections, virtual and augmented realities, digital exhibitions, influence marketing, museum patrons of today, cryptocurrencies, the Generation Z and their retail habits and even the economy of happiness. Divided into four half-days of breakout professional training, this space will be dedicated to 4 topics requiring special attention to better guide museums in their current transformations: artificial intelligence, management of data in museums, incubators of cultural startups in museums and new trends in museum retail. Due to high demand, we strongly advise you to book in advance. Mahuki is an innovation accelerator run by The National Museum of New Zealand with a vision to empower New Zealander’s to become world leaders in digital experiences and solutions for the culture and heritage sector. Launched three years ago, the programme represents a bold vision to link cultural knowledge and the Museum collections with business and innovation skills to enable New Zealand to be a globally admired innovation nation. In this talk we describe a model of working together between a museum (Mauritshuis), a large company (IBM), and a university (VU Amsterdam), highlighting the importance of collaborative mindsets as well as flexibility and long term partnerships, with an attempt to draw generalisable conclusions that other institutions might also be able to build on. Augmented, virtual and mixed-realities are not novelties anymore and cultural institutions are now using the tools to address new experiences and narratives to their visitors. During this panel, we will discuss how the transformation of the user journey and scenographies with new physicalities in a digital form could impact museum missions and professions. Seing museums as an international network of cultural heritage actors helps society movement to go faster and have a stronger local and global impact. ReACH is the first initiative towards one convention between leading figures of the museum and heritage sector to prepare the future of cultural heritage in this digital age. An increasing number of museums worldwide include digital contents in their exhibitions ; in many cases, exhibitions are entirely digital, with no museum artifact, and focus on virtual experiences, based on 3D, virtual, augmented or mixed reality. These new formats make it easier for museums to circulate exhibitions, but what is the business model of this type of projects? What are the specific costs of a digital exhibition, the market size and the expected revenue? Drawing on several examples and cases studies, the panel will answer these questions and many more. To be able to engage with this age group, we need to understand their values and motivation. What drives them? What do they find interesting? What do they buy, how do the shop? In this panel discussion we will present you with inspiring examples from both marketing and museums. There is a lot of room for your questions! This session will explore how to engage local artists and designers in your shop in a practical ongoing way based on your audience, location and institutional mission. What are the practical concerns to get started, create sustainable income and promote your projects? What staff and planning considerations do you need to account for within your team and operations? Who makes a good partner? How To Nail Influencer Marketing At The Museum? Today we are confronted with over 1500 advertisements per day, which makes it difficult for organizations to be visible in such a crowded media landscape. Cultural organisations also often face the challenge to attract a younger generation of people. Influencer marketing can be the key to achieve this goal. It’s the new form of word-of-mouth advertising. In 2017 the TextielMuseum started to experiment with influencer marketing. The results were promising, but also created challenges. What where the successes? What where the challenges? And how does it contribute to attracting a younger generation? Evelien Platteeuw presents one of the influencer marketing cases, which hopefully inspires you to implement influencer marketing in your overall strategy. We hear that the blockchain will dissrupt the financial market, but could it change the museum ticketing models and their economy? Long before a global adoption, Blockchain proposes alternative thinking systems - how can museums learn from the Blockchain culture as they have been inspired by the Web 2.0? Shall we start to talk about micro-philanthropy, shared-ownership or even shared-museums? Facing strong shifts and several revolutions, museums have new roles in our society. Activist, social binder, experience maker, museums nowadays are going beyond their collection and the experiences they offer and speak to the people that are visiting them before all trying to give them the best self-explorative journey. This panel will assess how museums are turning their mission into bringing Happiness to their audiences. Who Are The Patrons Of Today? In a time when commitment and meaning are valued, supporting arts get a new signification. This session will discuss the different profiles, behaviors and expectations of today's patrons and donors, how to identify and create a close relationship with them or how to develop a philantropy program where the donor is at the center. AI - it's time to demystified it! The talk will cover how advances in Artificial Intelligence can provide unprecedented ways to help museums in managing their collections as well as providing their audience with new ways to engage. Use case 1: Ask Mona (France) - How can we improve access to culture thanks to AI? IRIS+ is a recent open experience at the Main Exhibition, based on Artificial Intelligence. The cognitive assistant was built with IBM Watson - Artificial Intelligence platform for business - developed not only to respond to visitors, but also to ask questions. After motivating a reflection on the current period in which we live, the intention with IRIS+ is to encourage the visitor to think about their role in society and to act for a more conscious, tolerant and sustainable tomorrow. The visitor is asked how he/she can engage with his/her concern and, based on the response, IRIS+ presents, for example, projects from various organizations, foundations and institutions in Brazil, with whom they can connect for voluntary engagement. The talk covers a project at the Mauritshuis museum in the Hague, where a team of students led by IBM developed a question answering system for a Rembrandt painting, and investigated various important aspects of the technology, such as system robustness, crowdsourcing for training data, and matching speed and emotion of end-users' voices for engagement. The session will cover how advances in artificial intelligence can offer unprecedented ways to help museums manage their collections and offer their audiences new ways of communicating. How to make a biotopic in augmented reality? The Centre des monuments nationaux and the start-up Skyboy have developed, in the house of Georges Clemenceau at Saint-Vincent-sur-Jard, an "Overlap reality" project based on the use of 360° videos localized in the monument. This technology allows the public to discover this historic house with a new perspective, being able to discover Clemenceau in its intimacy. Gathering data from many cultural institutions to produce a cross-disciplinary outlook regarding visitor’s behaviour, KPIs to manage cultural institutions and new cultural product recommendation tool? This is the aim of the collaborative project ‘DataΜsée’. The workshop will address the issue of large-scale data valorization for cultural institutions: from data gathering (data collect, RGPD compliance, data normalization) to actual use cases for data analysis, and also strategic and organizational aspects. Introduction: Data? Big Data? Museum Data? We need some explanations. With the use of CRMs becoming the norm, museums get a better understanding of their own public. Next step is to gather data from many cultural institutions to expand the scope of the analysis (in term of public, territory, thematics,...). > Introduce the issue of data valorization for cultural institutions, the expectations and obstacles (like visitor’s trust, financial insights,...) regarding data sharing. Presentation of the project DataΜsée, strategic expectations regarding to the project. Identify the data good to collect / Which data is valuable? Before the analysis: data normalization and anonymisation / RGPD compliance. How Open Data Could Change Your Museum Life? > How to involve the public himself in the transformation, and avoid generating mistrust regarding the use of data? How to prepare your museum for the big data era? WORKSHOP: How to make a crisp and trendy product for your museum shop. What makes the merchandise in your museum shop successful, even trendy? In an inspiring, hands-on workshop we will look into what elements influence the success of a product and make it commercial – without losing the connection with the museum. Unlock your potential and kick start a new product for your museum store! Unlock your potential and kick start making a new product for your museum shop! First, we will start with some inspiration. How do we perceive the world around us; in what context does your museum shop operate? A dive into tourism, (museum)retail, and consumer experience. Secondly, you will design your own fresh museum-related product. A hands-on, basic cut and glue approach. Clever, insightful, and a true eye-opener. Takeaways: - Better understanding of the world around your museum shop, and how that influences your shop and your customers - A different look at your own museum product assortment.